In keeping with the cycle of life, we again usher in a new year. We bask in renewed hope that this year is better than the one that just ended. Not that it was not a good one, but there is always room for betterment and it is good to raise the bar each year. There is also room for contentment, I believe. I am very thankful for everything that has happened in the year that passed, good or bad. There is a good reason for everything and come to think of it, there is a bright side to everything. I am happy that despite all the doomsday hoopla, 12-21-12 passed like any other day and we are still all here proceeding as normal. So as usual, life goes on, thank God for that, and here I am still able to post the very first recipe of 2013. It is good to start the year with auspicious food so I want to share my recipe for good old pancit bihon to bid us all longevity. 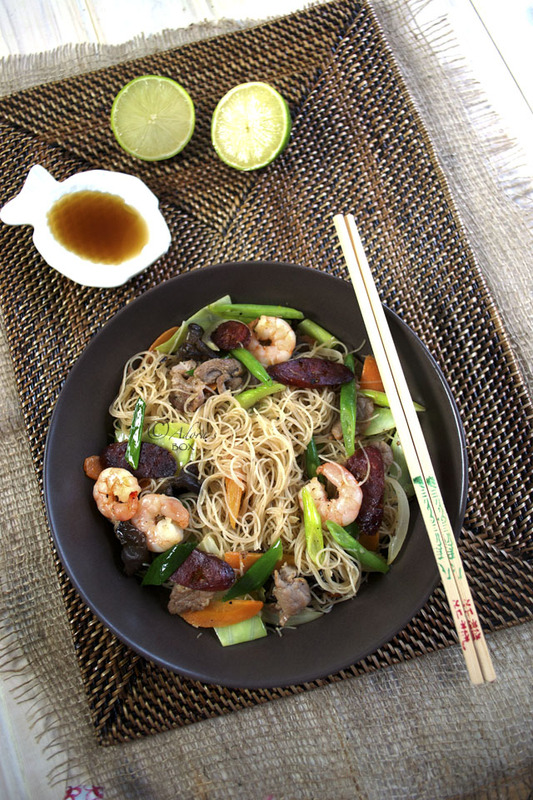 Pancit means noodles and bihon means rice vermicelli. 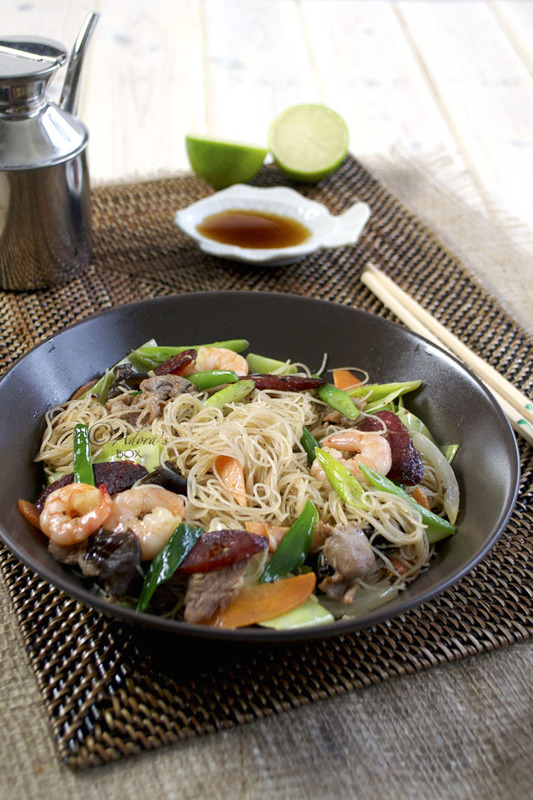 Collectively it is a dish of stir fried rice vermicelli. It is one of the most popular Filipino noodle dishes because it is inexpensive and the easiest to prepare. 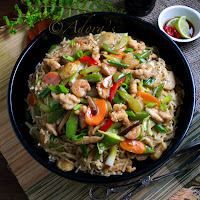 I have seen a lot of versions of pancit bihon and am very pleased that a lot of them were made by non-Filipinos! It just goes to show that anyone can make this dish. 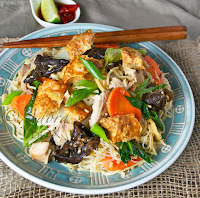 This recipe for pancit bihon is just a guide. Feel free to interpret it as you would. I would suggest that you follow the amount of noodles and stock at first try so that you end up with the right texture. Bihon or rice noodles/vermicelli become soggy when over soaked, over cooked or if too much liquid is added. 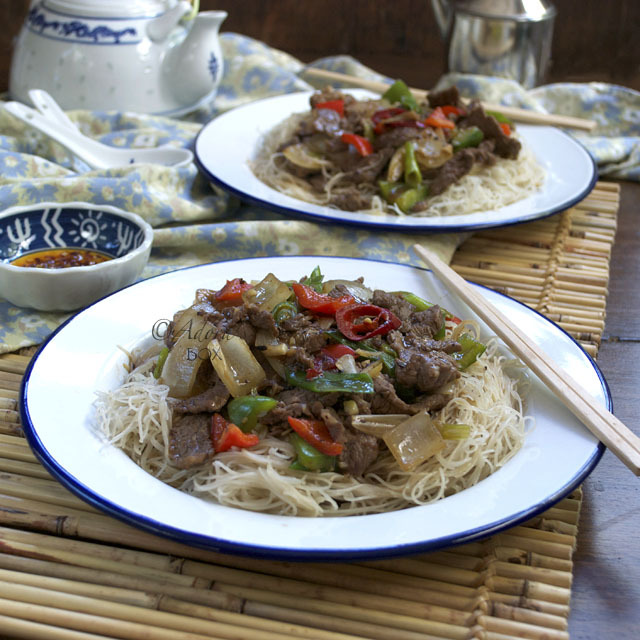 I use Yeo brand rice vermicelli because it has the best texture when cooked. I stir fry my ingredients before adding liquid because I want the flavour of the wok to enhance the dish. It also preserves the texture of the noodles and the vegetables. I would like to thank you all for your support for Adora's Box. As long as you visit here, I will keep the recipes coming. I wish you all a very good year! Prepare all of the ingredients before starting to fry. Season the pork with 1 tsp. light soy sauce and set aside. sliced Chinese sausages and briefly fry to render the fat, about 2 minutes. Transfer to a dish wit a slotted spoon and set aside. slotted spoon and set aside. Add the seasoned pork slices to the same wok and briefly fry until it changes colour, about 2 minutes. Skim off and set aside. Add the garlic and stir fry for just one minute. Add the onions and stir fry for 2 minutes just until it begins to cook. 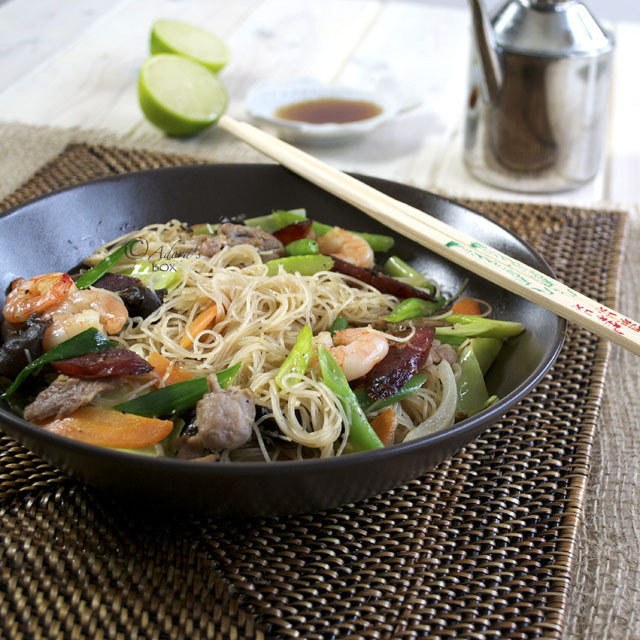 Add the cooked pork, prawns, carrots, green beans, celery, cabbage, the whites of the spring onions and the rice vermicelli. Stir fry for about 3 minutes until it starts to catch. Add in the stock, light soy sauce, oyster sauce, sugar and black pepper. Add in the sausage slices, black fungus and the green parts of the spring onions. Stir fry for about five minutes until the noodles are cooked and the vegetables are crisp tender. Add the sesame oil and give it a last stir. This is now ready to serve with calamansi halves or lime wedges and fish sauce on the side. You called this as "Bihon" too? Your fried bihun are full of rich ingredients..... oh boy...am I hungry now? Delicious. Hi Mel. I'm glad you call this bihon, too. A lot of times, people call it differently and have no idea of what I'm talking about. Hi Alvin, thanks. After eating rich food, this is such a welcome change. Hope you had a good holiday break. Well, I'll keep coming back because I don't want to miss these great recipes!! What a beautiful bowl of deliciousness!!! Happy New Year!! Hi MJ! Happy New Year too! This is my most favorite Filipino dish that my mom cooks - I think it's a great starter Filipino dish for non-Filipinos too because it introduces them to a new cuisine in an easy and simple way! Hi Peggy. I agree. It is easy to cook and it caters to all tastes. I think this is one of the most appreciated Filipino dishes.